Preschool Playbook: Ladybug, Ladybug, Fly Away. Bugs are a very popular theme in the summer time. My son helped me put together a common bug we see during summer, the ladybug. It's a craft that is very easy to make. 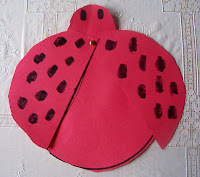 For the ladybug you will need: construction paper ( I used red), scissors, black crayon or marker, glue, and a paper fastener. 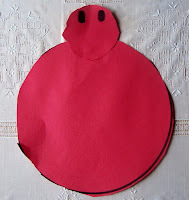 First on the construction paper you will draw two red circles of the same size. In one circle draw a line to split the circle in half. Then draw one smaller circle. I used a small plate to draw my bigger circles, and a cup to draw my small circle. The solid circle will be the ladybug's body, the split circle will be the wings, and the smallest circle will be the head. Have the child cut out the three circles, then cut the one in half. My son helped me with this project. You will notice that the circles are not perfect, and they may not have been cut exactly on the line, but it's just good practice to allow them to cut. Also, remember, circles are hard to cut. Next have them put two eyes on the smallest circle, and black dots on the two semicircles with the crayon or marker. Glue the head onto the full circle. Then with the paper fastener, attach the wings. A paper fastener will allow the wings to open and close. If you don't have one, you can always glue the wings on in an open position. Some variations for the project are to use a black ink pad and your child's thumbprint to add the dots, or you could use some pipe cleaners to attach antennae at the top. TA-DA, you're done. Nice and easy, but also cute. Another good one. Better yet, I've got tons of construction paper in red. Thanks! It really looks very cute. The basic construction is also rather easy for children to try it out themselves. My children really enjoy when they play with it. Sometimes their grandmother also play with them.